Louis Moult’s ‘real goal’ in double! 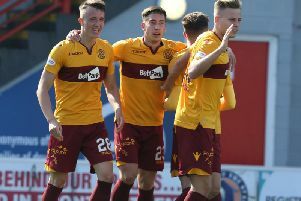 Mark McGhee has been recalling a gentle piece of half-time banter with Louis Moult which preceded the Motherwell striker’s second goal against Partick Thistle. After Moult had netted a first half penalty in the vital 3-1 win, McGhee joked with him at the interval that it hadn’t been a “proper goal”. “I said to Louis at half-time: ‘Was he going to score a real goal?’ said McGhee. “I told him that I never used to count my penalties. “And he got his real goal in the second half. I thought he was terrific. You see him at the end, chasing and chasing and chasing defensively. McGhee said that his three pronged attack against Thistle – Scott McDonald, Louis Moult and Marvin Johnson – had been “terrific” on the day. The Fir Park gaffer said that his side had looked so dominant after going 3-0 up that it made the concession of Thistle’s late consolation strike all the more disappointing. However, he said that ultimately all that mattered had been securing the three points. “At the end of the day I don’t care if it’s 10-9,” McGhee said. “If we win the game that’s what we’ve got to do at the moment. “We were disappointed to lose the goal but I don’t think we’re good enough to think that we’re never going to lose a goal. Motherwell moved up two places to eighth on the back of the Thistle triumph and sat just four points behind fourth-placed St Johnstone. But – ahead of two more crucial fixtures against strugglers Hamilton Accies and Dundee United in the next fortnight – McGhee sounded words of warning. “We have won before this season and then we’ve lost next,” McGhee said. “We are all capable of beating each other on the day. We are the ones that have won today and we are grateful for that and will enjoy it this week. “Hamilton is a difficult place to go. The surface is difficult to play on. We’ll have to cope with that.